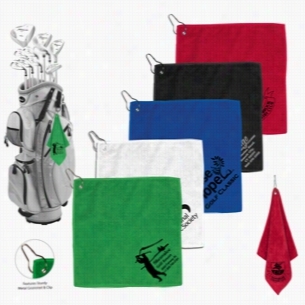 300GSM Microfiber Custom Golf Towel With Metal Grommet and Clip. Woodbury Golf Scorecard round Golf Tag Set. Combines the Woodbury Round Golf Tag and the Woodbury Golf Scorecard Holder. Golf tag features name and address card. Durahide leather scorecard holder. Price includes embossing on tag and scorecard holder. Box can also be imprinted. Includes wood tees and textured green Gift box. Includes wood tees and textured green gift box. 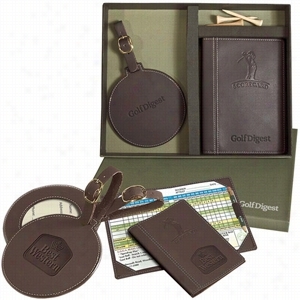 Woodbury Golf Pouch round Golf Tag Set. 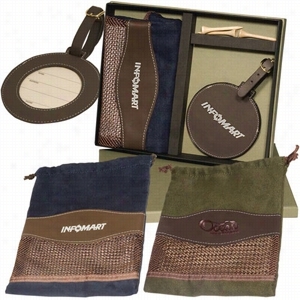 Combines the Woodbury Round Golf Tag and the Woodbury Valuables Pouch. Golf tag features name and address card. Pouch features ultra-suede pull-cord closure durahide trim and nylon mesh accents. Price includes embossing on tag and pouch. Box can also be imprinted. Includes wood tees and textured green Gift box. 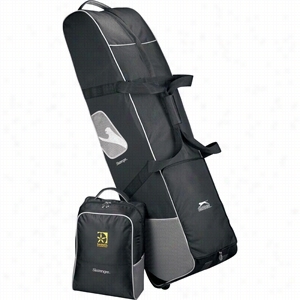 Slazenger Classic Golf Bag Cover. Cutter & Buck Tour Golf Bag Cooler. Part of the sporty Cutter & BuckÂ® Tour Collection, this cooler was designed with the classic Golf Bag shape in mind. 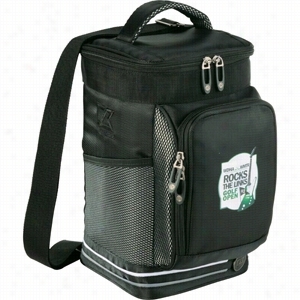 Great for cooling beverages on or off the golf course. 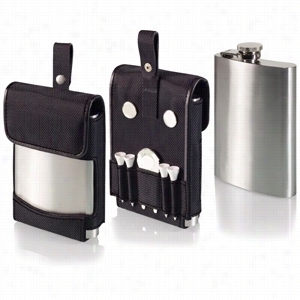 Zippered main compartment holds up to eight cans. 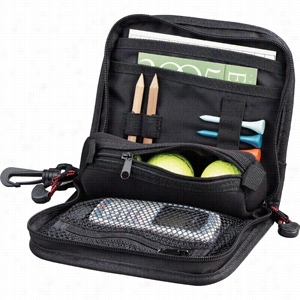 Zippered front pocket with additional organization for golf or sport accessories. Two side mesh pockets. Elastic band for tee storage. Padded carry handle. Removable, adjustable shoulder strap for easy carrying. Insulated PEVA lining. Cutter & Buck hardware and branding details. Material: 1680d Ballistic PolyCanvas. Manufactured By Leeds. HydroPouch! 24 oz Golf Ball Collapsible Water Bottle - Patented. Patent pending 24 oz reusable BPA-Free golf ball-shaped water bottle made of light-weight easy-to-fold, bendable plastic that means bottle can be collapsed flat and easily stored away when empty and stands like any other bottle when full. Made of durable Nylon with PE laminate bottle is freezer friendly. Designed for use with cool liquids only. Not Microwave of dishwasher safe. Hand wash only. Includes standard plastic sports cap. Bottles are lightweight and ship flat - great on your Wallet and the environment/carbon footprint. Features unique golf ball stock-art on front, clear panel back. Each bottle comes with reinforced grommet with carabiner for easy carry on the go. Note: Carabiner is designed for use with empty bottle only. Use of carabiner with full bottle may result in tearing and other damage. WARNING: CHOKING HAZARD-small parts. Not intended for children under the age of 13.Carabiner is designed for use with empty bottle only. Use of carabiner with full bottle may result in tearing and other damage. For QCA request, products will come with the PO number. Golf Ball Squeezies Stress Reliever. 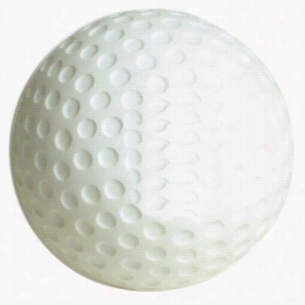 Golf Ball stress reliever helps reduce stress and have fun! Great for those tough days out on the green. With a few squeezes, they will be back on top of their game! Perfect for golf pros to country clubs owners, give these away at golf outings and at business expos to corporate events and you will score a hole in one with new customers! Due To Their Handcrafted Nature, Stress Ball Sizes, Colors And Textures May Vary. Factory Cannot Guarantee Consistent Imprints Or Pms Matches. Related Search Terms: Stress Reliever BallProducts are not intended for use by children or pets. They may present a choking hazard to children under 3 years of age. HydroPouch! 24 oz Golf Ball Collapsible Spray Top Water Bottle - Patented. Exclusive, patented 24 oz reusable BPA-Free Golf Ball-shaped water bottle with polypropylene plastic spray top.Bottles are made of light-weight easy-to-fold, bendable plastic that means bottle can be collapsed flat and easily stored away when empty and stands like any other bottle when full.Bottles are made of durable Nylon with PE laminate bottle is freezer friendly.Designed for use with cool liquids only.Not Microwave of dishwasher safe. Hand wash only.Spray tops enable bottle use to help keep you cool, water your plants and many other applications.Bottles are lightweight and ship flat - great on your wallet and the environment/carbon footprint.Features unique Golf Ball stock-art on front, clear panel back.Each bottle comes with reinforced grommet with carabiner for easy carry on the go.Carabiner is designed for use with empty bottle only. Use of carabiner with full bottle may result in tearing and other damage. CHOKING HAZARD-small parts. Not intended for children under the age of 3. For QCA request, Products will come with the PO number.